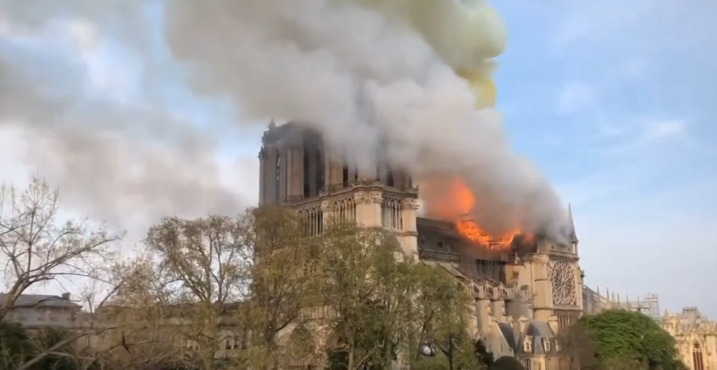 / Kaohoon International / Massive Fire Engulfs Notre Dame! Parisians Watch in Tear as the Iconic Spire Collapses! Massive Fire Engulfs Notre Dame! Parisians Watch in Tear as the Iconic Spire Collapses! A major fire broke out on Monday around 6 pm. at Notre Dame Cathedral, Paris, which quickly engulfed and spread through wood structure of the Cathedral. Parisians and tourists watched as firefighters tried to control the raging flame with broken hearts after the iconic spire and the roof collapsed. “The Forest” which known as Notre Dame’s medieval wooden roof structure was believed to have a massive damage or possibly lost. Later, firefighters were able to put out the fire. Due to the brief overview, the report stated that the main structure and the rectangular towers, which is its landmark had been saved.